Joe Root was the first man out in Jordan Clark’s hat-trick. LANCASHIRE paceman Jordan Clark took one of the highest quality hat-tricks in modern cricket as he removed Joe Root, Kane Williamson and Jonny Bairstow - three of the world's leading batsmen - before arch-rivals Yorkshire fought back on Sunday. England captain Root and New Zealand skipper Williamson are third and fourth in the International Cricket Council's Test batting rankings, with Bairstow a far from lowly 16th. Between them the Yorkshire trio have score 14,639 Test runs and more than 30,000 in first-class cricket, yet they all succumbed off successive balls to the 27-year-old Clark on the first day of the County Championship match. Statistician Andrew Samson reports it is the first time in first-class history that all three batsmen out in a hat-trick have each scored more than 3000 Test runs. Jordan Clark celebrates his hat-trick. Root and Bairstow's hopes of spending time in the middle batting in red-ball cricket ahead of England's first Test against India next month will now rest on the second innings at Old Trafford. Yet a day when the bowlers dominated saw Lancashire dismissed for 109 in reply to Yorkshire's 192, the visitors an unlikely 83 runs ahead on first innings at stumps. 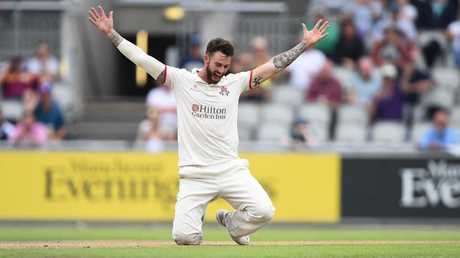 "I was happy to get my first wicket, so to get three in a row, I was over the moon," Clark, who went into the match with a first-class bowling average of 36.74, told Lancashire's website. 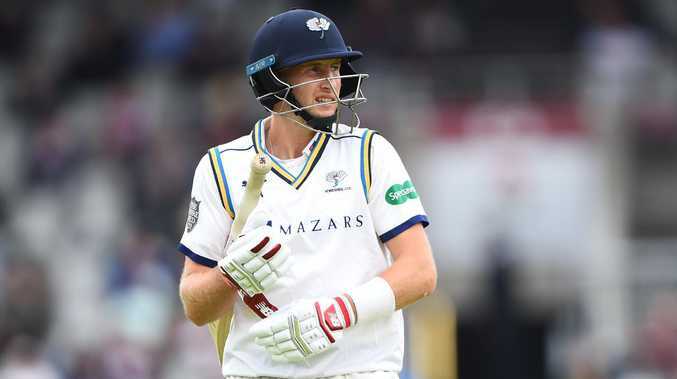 "This afternoon took the sting of it a little bit after they way we've gone with the bat," added the 27-year-old Clark, who in addition to his hat-trick went on to take career-best first-class innings figures of five for 58. As for suggestions his was one of the best hat-tricks in cricket history, the modest all-rounder replied: "I've no idea. It's obviously up there because they are all top international players. "Any hat-trick is great to get but getting those three makes it very special. It will live long in my memory." 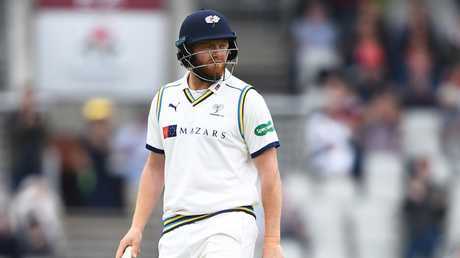 Jonny Bairstow was the third man out in Jordan Clark’s hat-trick. Root, who made 22 off just 19 balls on Sunday, looked in good touch as he hit consecutive fours at the start of Clark's second over. Bairstow, who has been in brilliant white-ball form for England recently, came in for the hat-trick delivery and edged an intended drive, with the Test wicketkeeper caught by England colleague Jos Buttler in the slips. Clark's hat-trick - the first in a 'Roses' Championship match since Lancashire and England paceman Ken Higgs took one in 1968 - left Yorkshire struggling at 4-61 at lunch. But former Test opener Adam Lyth made 70 before he fell to James Anderson, England's leading Test wicket-taker.